Sunday is my favorite day of the week for many reasons. In addition to (sometimes) sleeping in and going on a long run with my fellow ISH running enthusiasts in the morning, the whole House comes together for “family dinner” at 1 PM sharp on Sunday afternoon (why we call it ‘dinner’ is still a mystery). If you are late, you have to do the chicken dance—another great tradition at the House. I love sitting down on Sundays and looking around the room to see new and old faces—each and every person with a different background, culture, and set of life experiences, conversing and sharing a meal together. It’s really quite a beautiful scene. In a lot of ways, Sunday dinner at ISH reminds me of my family’s traditions growing up. For someone who has never lived in the House, this tradition may help illustrate why we think of ISH as more than just a place to stay while you are in school or doing an internship in DC. Traditions like Sunday dinner make ISH home. Every Sunday evening at 8PM, we gather as a community to discuss topics that we are passionate about and draw on our diverse life experiences to learn from one another. We call these gatherings Resident Salons. Generally, one resident will present on a topic that he or she has expertise in and will invite the opportunity for discussion, reflection, and debate—all in the spirit of open-mindedness and communal learning. 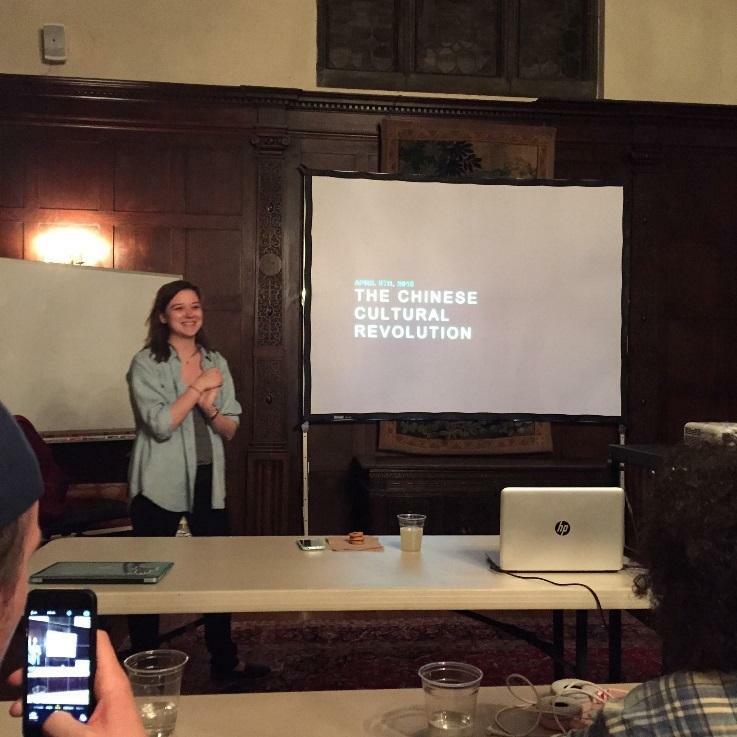 In the past, residents have presented on Sexism with Chinese Characteristics; Persian Film; Cancer and the Future of Biotechnology; Great White Sharks! ; The EU: Super State, International Organization, or Free Trade Zone? ; Pamplona, Spain; The Economics of Innovation; 10 Emerging Technologies that will Change our World, and many more. Without question, the Resident Salon is my favorite tradition at the House. *Cue Tevye from Fiddler on the Roof exclaiming, “Traaaditions, traditions!”* It was started by a truly extraordinary individual and friend—Jenny Spencer—nearly one year ago. A little bit about Jenny: Jenny graduated from the University of Colorado- Boulder with a BA in International Affairs in 2011. 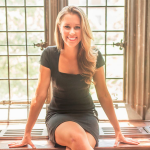 After graduation, she moved to DC to earn her Masters in Applied Economics at Johns Hopkins University. She chose to live at ISH to supplement her rigorous economics coursework with intercultural interaction and learning. The idea for the Salons originated from a presentation that a former resident gave about the developing crisis in her country, Ukraine in the spring of 2014. The presentation gave her a platform via which she could formally address questions about a very sensitive topic; explain, from her perspective, what was going on; and give those of us who knew very little about the region a sense of the politics and players that were behind the unraveling situation that we saw on the news every day. The turnout was incredible and many residents, including Josh Ettinger and Anjelika Deogirikar, who had helped to organize her presentation, discussed how great it would be to have similar events on a regular basis. It took Jenny, Josh and Anjelika a while, but they finally rolled it out, with the first official Resident Salon by Majd Ariss in October of 2014 about his country: Lebanon. With the help of other residents, Jenny officially started the Resident Salons because she wanted to create a space that would encourage more dialogue and discussion about issues that residents are passionate about. As housemates, we spend our mornings, afternoons, evenings and weekends with one another—but rarely do we delve deeply into the challenges our world is facing or discuss the role that we play as global citizens. The House is full of talented, interesting, and astounding people. In our day-to-day routines, we get to know each other on a surface level, and while we may have conversations about important topics at dinner, we often don’t realize the depth of authority and knowledge that we all bring to the table (literally and figuratively). As is often true of such outstanding people, many residents are extremely humble and are hesitant to share their accomplishments or ideas in casual conversations and settings. While this is admirable, we tend to do each other a disservice in this way. The Resident Salons allow residents to share their passions and interests with each other within an informal context at the House. What is truly unique about the Resident Salons is it brings together a group of curious, open-minded and talented friends who not only have big ideas, but also big hearts. It’s not just a space where we can discuss and debate important problems—it’s also a space where we can encourage each other, welcome new opinions and ways of being, and appreciate one another and our ISH community. Jenny’s hope for the Resident Salons is that they will be carried on through the years and will become as ingrained of a tradition as Sunday “family dinner.” We are already well on our way! Our next Resident Salon will take place on Sunday, September 25th at 8 PM. Fellow blogger and all-around rockstar, Justice Shorter will be presenting on, “Disability Rights Advocacy” and will be speaking about the project she worked on with the US Department of State to better accommodate foreign officials with disabilities when they travel to the US. The following week Munkhnaran Bayarlkhagva will be presenting on, “The 2015 Iranian Nuclear Negotiations” and will be sharing stories from his summer in Iran. Stay tuned for future blog posts on both presentations!